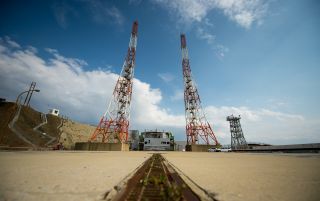 Launch pad 1 is seen at the Tanegashima Space Center (TNSC) on Monday, Feb. 24, 2014 in Tanegashima, Japan. A Japanese H-IIA rocket carrying the NASA-Japan Aerospace Exploration Agency (JAXA), Global Precipitation Measurement (GPM) Core Observatory is planned for launch from pad 1 on Feb. 28, 2014. The Tanegashima Space Center is Japan's biggest rocket-launching facility. It is located on an island in Kagoshima, the southernmost prefecture (or district) of the country. The site is mainly responsible for launching missions for the Japanese Aerospace Exploration Agency, also known as JAXA. Major launches take place from the Yoshinobu Launch Complex, including larger missions such as cargo runs to the International Space Station. Other facilities on site include spacecraft test and assembly buildings, and a range control center. The island itself is associated with the introduction of firearms to Japan (from Portugal) in 1543, according to JAXA. Construction of the rocket facility began in 1966 and space missions started lifting off there in 1969. Tanegashima was selected for several reasons. Its latitude of 31 degrees made it close to the equator, which makes it easier to launch missions because of the Earth's rotation. It was relatively remote, would cause "minimum interference" for Japan's fishing industry, and also had access to land, communications, water, electricity and public transportation. "It was extremely difficult to find a place that fulfilled all the above-mentioned criteria, especially since some of the criteria contradicted each other," JAXA wrote. "During the search and review of the candidate sites, the current site on Tanegashima Island was found to be the most ideal." There are many facilities in and around the center for launching rockets, and it also includes a press site and a museum. Not all of the facilities are in use; for example, the Takesaki Range used to send small rockets aloft to test them and to foster their development. JAXA said the testing was no longer required after the Takesaki series finished, allowing for missions to start launching to the International Space Station. The Osaki Launch Complex was retired in 1992 after being used to launch N-I, N-II and H-1 launch vehicles. This leaves the current launch facility as the Yoshinobu Launch Complex, which has two launch pads, a firing test facility and various buildings to assemble and track spacecraft. Japan launches cargo missions to the International Space Station roughly once a year, under the HTV launch program. (HTV stands for H-II Transfer Vehicle; the program is also called Kounotori, or "white stork." The rockets leave Tanegashima and are snagged by astronauts, using the robotic Canadarm2, once the spacecraft arrive at the ISS. The spacecraft can carry about 6,000 kilograms (13,000 lbs.) of supplies to the ISS, in both pressurized and non-pressurized environments. Astronauts can unload part of the spacecraft, while other parts of it are accessible to the Kibo robotic arm for experiments outside of the space station. Some of the notable payloads in this program include the JEM Small-Satellite Orbital Deployer, Cubesats, a replacement water pump assembly catalytic reactor (to replace one that broke in orbit), a high-tech aquarium to house small fish, Kirobo (a robotic companion), and a small jet backpack for emergency use during spacewalks called Simplified Aid For EVA Rescue (SAFER). As of September 2016, five missions have launched successfully from Tanegashima in the preceding seven years. Four more flights are planned in each of the years from 2016 to 2019. Advanced Land Observing Satellite (ALOS, also known as Daichi): This launched in 2006 and operated for five years. Its notable contributions include observations after the 2011 tsunami hit Japan. SELENE (Selenological and Engineering Explorer), also known as Kaguya. This was a lunar mission that ran between 2007 and 2009. Among its achievements include a detailed gravity map of the moon's far side, and better lunar global topography maps. Greenhouse Gases Observing Satellite (GOSAT, also known as Ibuki): This launched in January 2009 to measure greenhouse gases, specifically carbon dioxide and methane. The Venus Climate Orbiter (also known as Akatsuki and Planet-C): It was launched in May 2010 but failed to reach orbit at Venus as planned, in December 2010. The spacecraft continued to orbit the sun for five years until it was put into an alternative orbit in December 2015. It is examining items such as Venus' atmosphere and clouds. IKAROS (Interplanetary Kite-craft Accelerated by Radiation of the Sun): An experimental solar-sail spacecraft launched along with the Akatsuki mission. It was the first to test out solar sails in interplanetary space, which included passing by Venus in December 2010. Global Precipitation Measurement (GPM): A joint mission between JAXA and NASA to look at the Earth's precipitation with an eye to better forecasting hurricanes and other extreme events. It launched in 2014 and is still operational. Hayabusa 2: This asteroid sample spacecraft launched in December 2014 en route to 162173 Ryugu. It is expected to stay at the asteroid for a year and a half after arriving in July 2018, including deploying a few spacecraft on the surface. It will leave in December 2019 and return to Earth in December 2020. ASTRO-H (also known as Hitomi and New X-ray Telescope, or NeXT). This mission was supposed to be an X-ray satellite to look at items such as dark matter, galaxy clusters and cosmic rays. It launched on Feb. 17, 2016, but experienced several problems with its attitude control system, leading to a loss of contact on March 26.